I lived in Galway, Ireland for 2-1/2 years, going to countless sessions and several fleadh's mostly in the west in and around Galway. As I have a lifelong love of Irish music, I picked up the "ear" of learning by the Oral Tradition. Though I rarely remember a tune name, I can learn them rather quickly. I believe I know somewhere between 600 and 700 reels, jigs, slip jigs, hornpipes and waltzes. 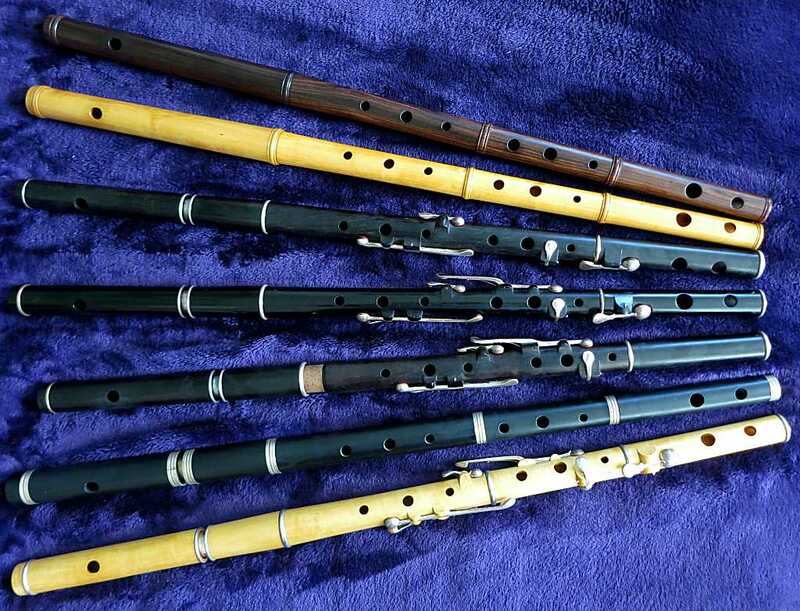 My flutes are made by: Patrick Olwell (2 keyed, 2 unkeyed), Eamonn Cotter (1 D keyed, 1 Eb keyed) and Michael Cronnolly (M&E polymer). All were bought new from the makers. This is my latest craft/hobby. Scalemail is glittery and fun, a piece can be made to accent almost ANY costume. I love playing with the colours and styles, experimenting with combinations of chains, scales and chainmail techniques. Recently I've started teaching workshops on how to do this craft, mostly because I want to encourage friends to make their own instead of asking me "Can I buy this from you?" Although I love making these pieces, each one takes a long time and there's no way I want to (or could) make a living off of this. I might sell some of the pieces someday. Meanwhile, it's all about the flair. Interactive means one or more people have a hands-on experience with the art piece. It either reacts to you doing something or parts of it move in such a way that you change its function or form. Or it changes you. Collaborative to me means several people working together to create one artistic vision. It is most often spearheaded by one individual, though several others might have important artistic contributions of their own. The Hall of Mirrors Arcade (HOMA) project was my first go as Lead Artist for a project that is both Interactive and Collaborative. About fifty burners from the Baltimore and DC communities pitched in to bring these 3 art pieces to three regional festivals and Burning Man. Hundreds (maybe thousands?) of people enjoyed playing the games -- and I have pictures to prove it! Yeah, I used to make dulcimers. Seriously enough that I own the domain dulcimer.com. (There are currently no dulcimers for sale.) When I started doing a lot of travel, woodworking as a whole slacked off considerably. I've only built two dulcimers in the past couple of years, though those two were the best I ever made. Interest in woodworking started with Shop Class in 7th grade with Mr. Panarella. (See? A teacher really leaves a mark on you when you remember their name after so many years!) He was pretty strict both with safety and quality. As a result, I still have all my fingers after years of woodworking, and my sanding/finishing skills are pretty good. I self-taught myself joinery and a whole bunch of other techniques. Some things were learned from books. That Shop Class was my only formal training. I never apprenticed, though at one time I had an apprentice. Like many others, I was mesmerized by the sight of people twirling fireballs around their body. Until I tried it myself, it was a "black box" art -- exotic, mysterious and seemingly dangerous. My poi instructor (she's really good - I'll tell you about her someday) had me doing the 3-beat weave in about 20 minutes. That seemingly innocent learning was, I think, the catalyst for a series of deep and meaningful changes in my life. Those changes are continuing to this day. It was because of that episode I now know I should never limit the belief in what I can achieve. We can do anything, if we believe in ourselves. I didn't know it then, but this was the beginning of a new spiritual journey for me. I am primarily a flowy poi spinner. I prefer cathedral or monkey fist heads and standard chain over ball chain. I still remember my first spin with live fire -- vividly. That night I spun 4 times and burned myself twice. I remember wearing the chain-shaped burn marks like a badge of accomplishment. I now teach others the basics of poi movement, with a focus on wrist/plane control. I myself am still learning. Recently I bought my first fire staff and found someone who lives in Seattle that I very much want to learn Contact Staff from. His flow technique was like watching the staff do tricks on its own. I want to be that good! !